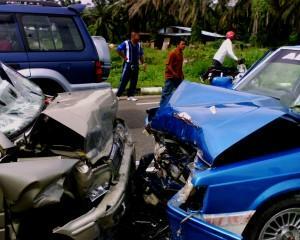 Although any type of car crash has the potential to cause life-threatening complications, injuries, and death, head-on collisions are particularly dangerous as the combined speed of two cars significantly increases the magnitude of the accident. In other words, if two cars are traveling toward each other at 45 miles per hour, the force of the collision is 90 miles per hour. Those who have been injured in a head-on collision accident are urged to seek legal counsel as soon as possible. An experienced attorney who understands the devastating consequences of head-on collisions can review your case, determine if you have a valid claim, and help you to seek the compensation to which you may be entitled. According to a study published by the American Association of State Highway and Transportation Officials, head-on collisions can occur anywhere but are more likely to happen on specific types of roads and under certain conditions. The data suggests that drivers are most likely to be involved in a head-on collision accident on narrow, smaller roadways where vehicles are traveling directly beside each other but in opposing lanes. Additionally, head-on collisions are more likely to occur if one driver is speeding and suddenly loses control as is often the case in distracted driving, fatigued driving, and drunk driving wrecks. Head-on collisions often occur at high speeds, as most of these incidents involve drivers who are fatigued or who are under the influence of drugs and alcohol and unable to maintain control of their vehicles. In these cases, drivers are unlikely to engage in crash-avoidance behaviors such as slamming on the brakes to attempt to avoid hitting the car in front of them or swerving to avoid a head-on collision. However, due to both the angle and the force of the impact, many drivers in head-on collisions sustain severe and life-threatening injuries. Unfortunately, victims suffering from serious injuries will also face mounting medical expenses. If you or a loved one has been injured and you would like to learn more about filing a lawsuit against the liable party and recovering damages for your injuries, contact an experienced attorney today. Depending on the circumstances surrounding your injury, you may be entitled to recover damages for lost wages, pain and suffering, and medical expenses, or wrongful death if you decide to pursue a claim on behalf of a loved one killed in a head-on collision. We, the expert Georgia head-on crash injury lawyers at Van Sant Law, specialize in helping victims of serious car accidents. Give us a call today at (404)991-5950 or fill out our free, no obligation contact form and see how we can help you receive compensation for your head-on collision accident.